The stage was set for the clash for first place in the Big West title race, as the UC Irvine men’s basketball team (18-7, 7-2) spent the week in Honolulu for their Thursday night matchup against the University of Hawai’i. In what was considered by many to be the marquee matchup of the conference this season, ultimately resulted in a one sided affair that saw Hawai’i trounce the ‘Eaters, 74-52, solidifying their top spot in the standings. The Rainbow Warriors (19-3, 8-1) got their revenge from last season’s conference tournament final loss and left a statement that they are the team to beat in the Big West. The game featured the conference’s best offense against the best defense where offense seemed to be too much to overcome. The Rainbow Warriors were able to make 14 threes, tying their most in program history, against the ‘Eaters patented zone. Ironically, Hawai’i came into the contest second to last in three point percentage but caught fire at home, shooting 47 percent for threes, in front of the boisterous crowd of 9,826 in the Stan Sheriff Center. The ‘Eaters suffered their first conference loss, seventh overall, on the road against Hawai’i. Senior guard Roderick Bobbitt fueled the Rainbow Warrior three point barrage by converting six shots from beyond the arc, totaling a game high 23 points alongside seven assists and six rebounds. Junior guard Aaron Valdes also chipped in the fun by notching 16 points and nine rebounds. 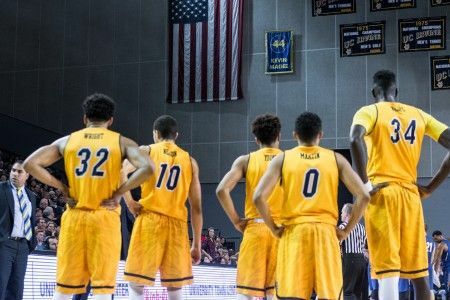 The ‘Eaters’ poor 31 percent shooting from the floor caused the game to be out of reach early against a motivated Hawai’i squad. An early 11-9 advantage for the ‘Eaters would be the only time they had the lead in the game as they went on to be scoreless for nearly next nine minutes. Hawai’i began to shoot the three ball early on and cashed in nine of their 14 threes in just the first half alone. A 13-0 run for the Rainbow Warriors widened the lead to 38-21 at the end of the first period of play. Junior center Mamadou Ndiaye caught a rhythm in the opening minutes in the second half, after being held to just two points in the first, scoring eight of his 10 points on the contest. The ‘Eaters managed to cut the lead to just 12 points but that would be as close as they would get, eventually surrendering a 24 point lead in a blowout game in favor for the Rainbow Warriors. The ‘Eaters will have to recuperate quickly as they are set to defend the Bren against CSUN tonight at 7:00 p.m. (ESPN3). UCI will have another crack at Hawai’i on Feb. 20 at 8:30 p.m. (ESPNU) to end the season series.